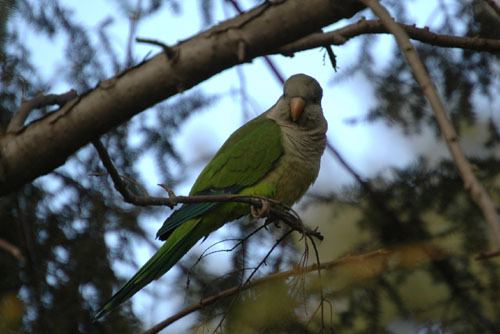 Our recent photo encounter with the Brooklyn Monk Parrots at Green-Wood Cemetery naturally raised the question of the status of the poaching situation that was widely reported last year. (Dozens, if not hundreds, of parrots were snatched from their nests, wiping out several colonies.) So, we asked Steve Baldwin, of Brooklyn Parrots, who is the authoritative source when it comes to our cool green friends, if parrots were still being poached and if the situation was getting better or worse. His answer: the poaching seems to have diminished, but several of the parrot colonies have been pretty decimated. Mr. Baldwin said that, as far he knows, birds are no longer being snatched from their nests in significant numbers. "My concern is as the weather warms, and street activity increases, we may see more incidents," he said. "This is why I've tried to 'wake up' the neighborhoods to the fact that people should be on the lookout for suspicious activity." He mentioned the hopeful fact that new birds have even reappeared in a few nests from which others were taken, but added that he isn't anxious to publicize the locations because he doesn't "want to tip off any bad guys who might be Googling for the parrots!" Several of the colonies were decimated by poaching last year. A colony on Avenue I in Midwood was "hit hard" as was Marine Park. Sadly, Mr. Baldwin noes that "I believe all the nests on Gerritsen Avenue are now empty." At least one freelance parrot poacher operating around Brooklyn College was said to have been caught last year. "His modus operandi was to park his van on Campus Drive, and sit in the driver's seat, reading a newspaper to divert suspicion from any regular passing police patrols," Mr. Baldwin said. "He set up a wooden box by the kerb, baited it, and attached a line to the box. He watched when the birds came close, and if any went under the box, pulled the line. He nabbed about a dozen birds this way. Eventually, neighbors became suspicious, and raised the alarm." Another poaching tale came from a pet store on Kings Highway. Mr. Baldwin said that a friend was in the shop looking at Quaker Parrots. "One of the employees, apparently a teenager, casually mentioned that his roommate had grabbed a few birds from somewhere in South Brooklyn," he said. "She played dumb, as if she was unaware of the poaching, and let him spill his tale. Apparently his roommate thought doing this was legal, and completely OK. I think this poacher was just a one-timer, not a systematic poacher." GL is certainly glad to hear that the parrot poaching problems seems to have diminished, but there is the possibility that the people taking these wonderful birds could strike again. Mr. Baldwin sadly had to remove his wonderful Brooklyn parrot Google map mashup from his site because he didn't want to provide poachers with a location guide, but we can tell you that the Green-Wood colony in the main gate on Fifth Avenue is worth checking out. The nests are very high up, so the parrots are safe. Visit them if you are passing by. You'll be glad you did. Who is Poaching the Parrots of Brooklyn? Sadly, Mr. Baldwin is Correct, All of the Parrots are gone.